Christmas has come and gone, and my girls got a lot of great stuff from Santa. 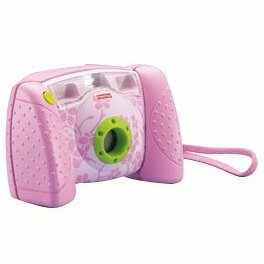 But in the interest of blogging, I have to say the best thing this year was the Fisher Price Kid-Tough Digital Camera she got from her Madrina. You can pretty much guess what it does, but what it does it does well. Even though she's only two and a half years old, after we loaded the batteries Madame instantly started running around the house with it, taking pictures and then looking at them on the little screen. It holds 30 pictures in internal memory (but you can add an SD memory card) and at 640x480 the image quality is pretty good. I even made a flickr page for her to share them - all of these pictures of things from her perspective. They're sold out in a lot of places (including Amazon at the moment), but if you're child is at all interested in cameras, this is the gift for them.